It doesn’t take much time to create a firestorm in the sport of boxing. As it has been widely reported, two-division world champion Canelo Alvarez, the biggest cash cow in boxing, caught the boxing public by surprise earlier this week when it was reported that he had signed a lucrative $365 million contract, for 11 fights over five years, to compete exclusively on the DAZN streaming platform. The news sent shock waves through the sport, as Alvarez inked the richest sports contract in history and people began wondering who his future fights would be against. One man, if you ask Canelo, who he would like to rematch is Floyd Mayweather, who is still technically retired. Mayweather handed Canelo his first and only defeat five years ago in Las Vegas after dominating him for twelve rounds. Now there is talk of Mayweather possibly facing UFC superstar Khabib Nurmagomedov, who defeated Conor McGregor earlier this month. Mayweather also defeated McGregor, in a boxing match last year, but Canelo doesn’t feel Floyd should be facing UFC fighters. 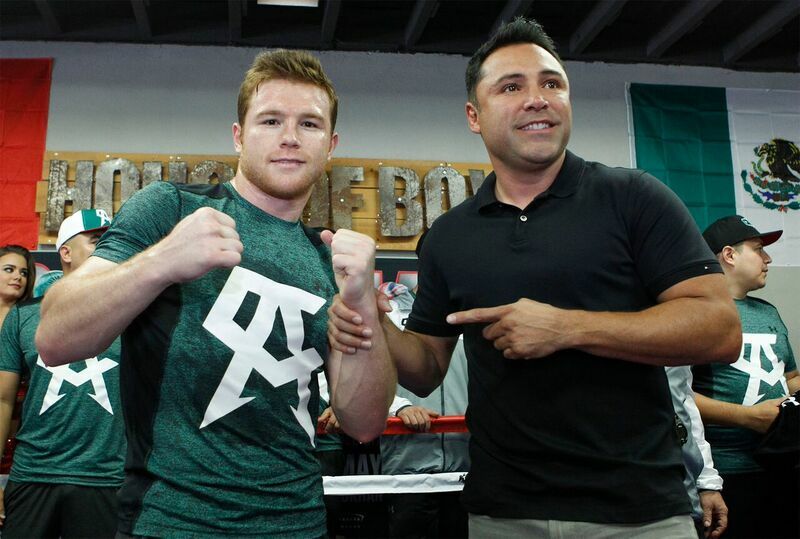 “He wants to continue hurting boxing by making fights that don’t make sense, and not giving boxing the credibility it deserves,” Canelo told TMZ Sports. Mayweather obviously took great offense to those comments made by Canelo and took to his Instagram, where he posting the following post, along with a photo of him landing a clean blow to Canelo during their bout. Mayweather’s ‘PED steak’ comment was in regards to Canelo failing a pre-fight drug test for the performance-enhancing drug Clenbuterol prior to his rematch with Gennady Golovkin. Mayweather also took a shot at Canelo’s promoter Oscar De La Hoya, who he also beat in the ring. Not to be intimidated, De La Hoya soon took to his own Instagram and posted a caption of his own worth viewing, seen below. Definitely some drama brewing between both sides here. In these days, all it takes is an interview with TMZ, and a few social media posts to set the sport on fire with headlines. In reality, Mayweather vs. Canelo II would be an intriguing fight but could you blame Floyd for looking at possibly more lucrative options? This one isn’t over yet. Stay tuned to see if both sides have anything else to say.